Keeping meetings and agendas in perspective and under control. Before I read David Allen’s Getting Things Done® book more than 10 years ago, I was not particular conscious about my “personal productivity”. But what I learned made perfect sense and led me through a period of my life that got increasingly busy—to a point where today some “productive” behaviours turned into habits and I started to worry less about my productivity and priorities since I feel comfortable with the control I have or sometimes also not have. 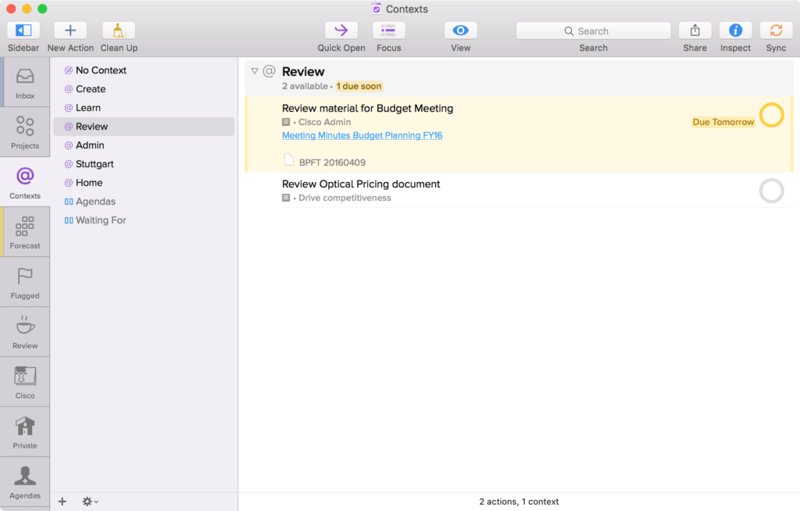 OmniFocus is one of my key tools which has been part of this journey since early 2008. As I started to more consciously reflect on how I organise my life and myself I wanted to share my experiences with the wider community which resulted in my blog at SimplicityBliss.com. I am still humbled by the amount of OmniFocus users turning to my writing for inspiration and advise. Next to my writing, other creative adventures, my family and sport, I am Senior Sales & Strategy Manager at Cisco responsible for a business and team distributed across Europe, Middle East, Africa and Russia. Maybe because my job happens to be in a big corporation I have the privilege to share OmniFocus and wider productivity use cases that resonate well with people in similar environments while many others write about small companies or work and life as a freelancer. A large part of my job is about business travel, meetings, web and video conferences. While I am blocking out time every day to do some real and hopefully creative work, at least half of my day is about interacting with others. As I go from meeting to meeting and from call to call the subjects and people change which means I need to be on a different topic fast and have my mind and focus in the moment quickly. 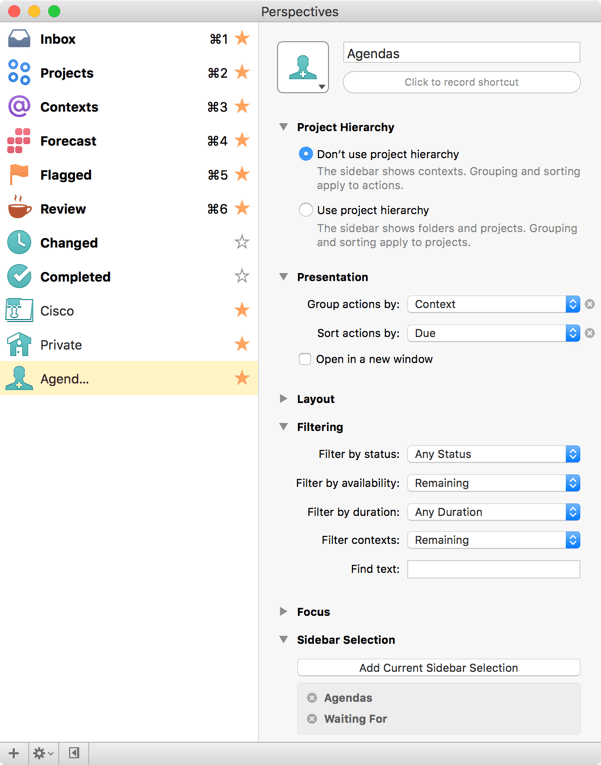 This is where OmniFocus helps me a lot. In my Weekly Review, which happens every Friday afternoon, I create Actions in my “Cisco Admin” Single Action Lists for each significant meeting or call in the coming week prompting me to review any support material such as notes from the last meeting, any briefing documents or presentations shared upfront. These Actions are in my “Review” Context and have a Due Date on the day of meeting at 9.30am in the morning. Each day of the week I typically do not accept any meetings or calls before 9.30 am and use the time for some creative/high energy work and to prepare for the day ahead. This is where the Review Actions created in my Weekly Review pop up based on their Due Dates and with the links in the note sections to meeting minutes I keep in Evernote, or to other documents. This helps me only needing 5-10 minutes ahead of each meeting to get (back) into the respective topic. “You never forget anything, do you?” is what I hear very often in meetings. It is actually not true: My brain is empty of reminders because I need its capacity to think and create, not to remember that Suzanne was meant to get that survey data analysed. The reason I appear to never forget a thing is because I keep it in OmniFocus. During any meeting, but mainly in the 10 minutes after it closed, I am sitting down and typing my actions into OmniFocus’ Inbox. When the subject of the meeting falls within my direct responsibility I also track the actions assigned to others which I will be waiting for. Because I am lazy I use TextExpander to help with recording all these Actions. The shortcut “wf” expands into “Waiting for” and “tcb” into “to come back re”. So “Waiting for Charles to come back re customer requirements” is captured rather quick. Most of the time I leave Actions captured throughout the day in my Inbox until I get to clean it up by assigning the “Waiting For” context and — where applicable — a project at the end of the day or during next morning’s preparation session. There are too many people I interact with and too many standing meetings as well to maintain individual Lists or Contexts for each of them. Instead I make sure I use either the person’s name or the meeting’s title or subject in the Actions I am capturing. The same I do for any topic I want to raise in a particular meeting or with an individual when I get to talk to them the next time. 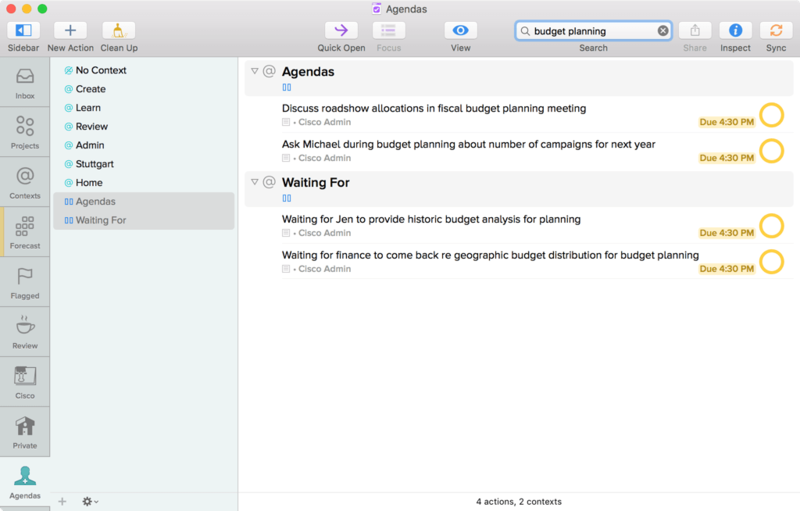 When I bump into that individual or sit on the respective meeting or call all I need to do is to open my “Agendas” Perspective which I have assigned to the “^A” keyboard shortcut, hit ⌘⌥F to focus OmniFocus’ search field and type (a part) of the person’s name, meeting title or subject. Because the Perspective spans my “Waiting For” and “Agendas” Contexts the search will return outstanding actions as well as topics to discuss and guide me through the meeting, often to the astonishment of the other attendees. You can talk to any OmniFocus nerd and all of them will tell you how important regular Reviews are. Luckily OmniFocus 2 adds a special view for this. However, for keeping your meeting, agenda and “Waiting For” Actions current the Forecast view is better suited. When I capture Actions or subjects for discussion I always assign a Due Date to them that corresponds to the date of the next meeting on the subject or with the particular individual. If your company is anywhere as dynamic as mine is, meetings get moved around, postponed, cancelled and rescheduled a lot. As a consequence the Due Dates you originally set get out of sync easily. This is where my daily preparation ritual mentioned early comes in to fix things and keep my machine running and my system trustworthy: I look at the Forecast view each morning and as it neatly incorporates a view of the day’s schedule I can easily spot if some meeting related Actions show as due, but the actual event is no longer on. If this is the case I invoke my global keyboard shortcut for Fantastical (⌘⌥^K), press Tab once to get into the search field and type the title of the meeting or the name of the person to find the new meeting date which I then use to update the Actions mistakingly shown as due for today in the Forecast view. 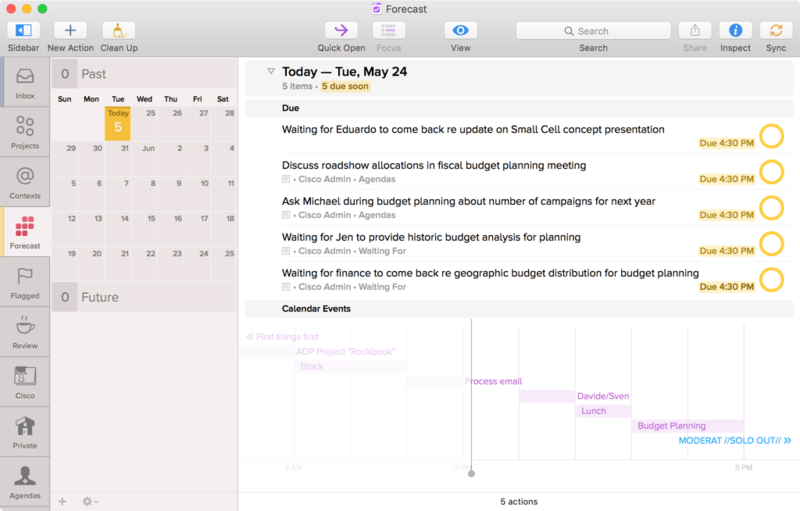 If it is more than one I can even press Control and select all relevant ones with the mouse to drag and drop them on the new meeting date in the OmniFocus Forecast calendar. Sven blogs over at Simplicity Bliss and started a brand new German podcast, Der Übercast, focused on technology. He gave a fantastic talk on Contexts at the 2013 OmniFocus Setup.